Which ingredients will you always find in your kitchen? Essentials for me include lemons, onion, garlic, black pepper, tinned tomatoes, parmesan and pasta. If these are in the larder, I’m happy and can rustle up a meal or three. Top of KP’s list would be pickled beetroot. We always have a jar in the fridge which he reaches for as soon as he gets in from work. It’s precisely that version of beetroot which has put many people off it forever and this beautiful sweet, earthy root has so many better uses than being dunked in vinegar. Just look at the fabulous variety of recipes from Scandinavia. When a muffin recipe using courgette and sesame seeds landed in my in-box I remembered the unkept promise I’d made to myself when I baked courgette cluster bread, to make a beetroot version. The muffin recipe got the purple root treatment instead, with some walnuts to off-set the sweetness. The vibrant pink colour intensified by cooking was quite shocking but the taste was moreish. They became darker pink as they cooled and would make a good breakfast or mid-morning muffin. Like sour cream with barszcz, a creamy taste goes well so I might fold in some feta or soft goat’s cheese next time I make them. Juice it – put one small beetroot, two apples and a stick of celery through the juicer (always dilute beetroot juice with other vegetables due to its strength). Make salad of equal amounts of grated carrots, grated beetroot tossed with some chopped parsley in a mustard-based vinaigrette. Roast whole and unpeeled (200 C for about 45 mins) with a couple of sprigs of fresh thyme, olive oil and sea salt. A bright pink beetroot dip can be made by softening some chopped beetroot in butter then adding a splash of balsamic vinegar and water and steaming with the lid on for a further 10 minutes. Blitz with a pinch of brown sugar, seasoning and ground cumin then stir in some creme fraiche. As a side dish: toss some apple slices, sautéed in butter, with warm, cooked beetroot, add a dash of creamed horseradish and a squeeze of lemon to the pan juices, combine and garnish with chives. Beetroot soup (barszcz) is quick to make, warming, and beautiful to look at. Use the tender leaves from summer beetroot in salad. Beetroot bruschetta – diced cooked beetroot on slices of sour dough with melted Brie on top. As an ingredient in chocolate cake (just think how moist carrot cake is). Here’s a nice gluten-free recipe. Beetroot chutney. Simmer 750g diced raw beetroot, 2 small, chopped onions, 1 1/2 grated apple, zest and juice of a large orange, a tablespoon each of mustard and coriander seeds, with 400 ml white wine vinegar, 300 ml balsamic vinegar and 350 g light brown sugar for about an hour (until thickened). Pour into sterilised jars. *If you can’t get buttermilk where you live (e.g. Dubai) you can make a substitute. Here’s a good guide by Chef and Steward. Alternatives: Replace about 50g of the beetroot with sultanas or grated dessert apple for a sweeter taste or crumbled feta for a creamy one. Preheat the oven to 200C. Grease a 12 cup muffin pan or line it with paper liners. Lightly beat the eggs together in a bowl, then beat in the buttermilk and oil. In a large bowl, sift together the flour, baking powder, salt and pepper. Stir in the grated beetroot, thyme and chopped walnuts. Make a well in the centre of the mixture and add the liquid ingredients. Stir gently until just combined; don’t over-stir, a lumpy batter is best for muffins. Spoon the batter into prepared muffin pan (I recommend an ice-cream scoop for this) and place a walnut on the top of each one. Bake in the centre of the oven for about 20 minutes. Cool in the pan before serving. Best eaten on the same day of baking (they freeze well though). I’ve baked these for Muffin Monday, a great idea by Baker Street. She describes it as “a culinary journey of sharing a wickedly delicious muffin recipe every week” ; drop her a line if you’d like to join her. Beetroot is in season, so what are you waiting for? For further inspiration pop over to Simple and in Season over at Fabulicious food. I’d love to know which ingredients you can’t live without. And are you a beetroot-a-phile or phobic? Oh Cindy – this made me laugh. The twin of KP – heaven forbid! Bet he likes rugby and golf…? What a wonderful rendition! Beetroot and walnut are such interesting combinations and only tasting could let me know how they work. I sense that An’s site is down and so can’t really see the round up. I used her recipe as it is with a little modification suiting my taste. beautiful muffins! What a delicious combination of ingredients. 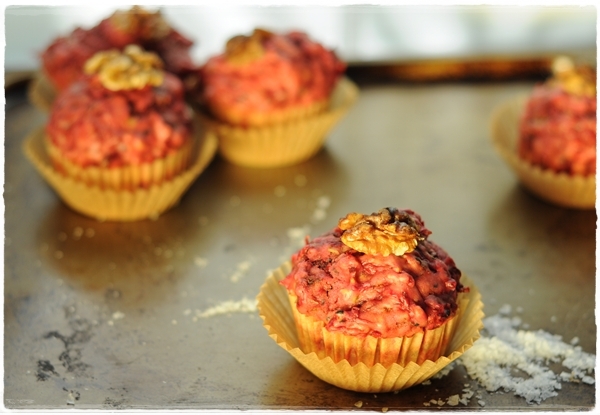 Love the idea of beet in muffins…and the muffins look cute! Wow Sally!!! 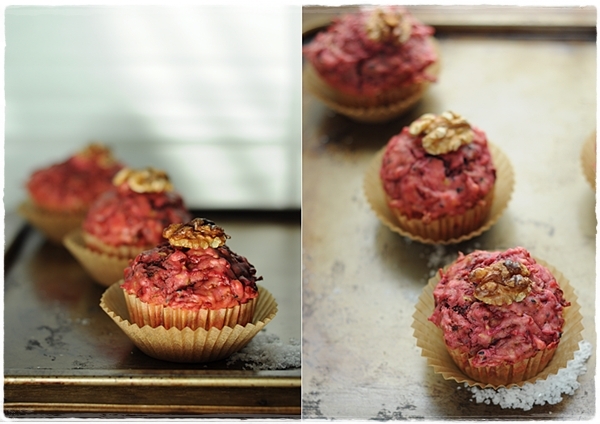 I absolutely love beetroot,i use it a lot so i´m gonna hav to “steal” this recipe from you! I´m giving it a try it looks delicious! welcome to muffin monday, sally! Love the color of your muffins. I haven’t tasted beetroot but I bet it’s delicious! Fascinating! And gorgeous muffins! My brother swore by pickled beets in cakes and this is the next step. Wonderful recipe! Awesome post – gotta love good old beetroot! Super recipe too. You’d be amazed by how many people don’t love it Mandy. I’m with KP on the beetroot jar in the fridge. Cheese and beetroot and mayo sandwich on granary to die for!! thanks for the beetroot tips Sally and will def make the muffins!! I’ll know which sandwich to give you for lunch next time you are passing. You and KP can tuck in together! by the way emmental or cottage cheese are my top choice haha! Chinmayie and Orange Thyme – thanks for dropping by. wow such a wonderful color! 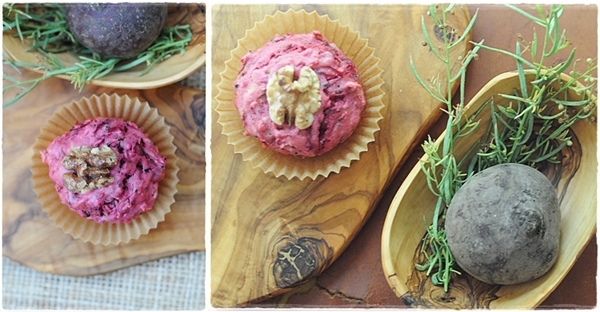 I’m not a beetroot fan..but this muffin might just change how I look at it. It’s so pretty! Love the look of your muffins. Great info on the beets! Cheers Alan, Abigail and SE (Side). Enjoyed making these although they are quite an unusual taste. Fantastic! I made beetroot brownies and took them to work. My colleagues were divided: several came back for seconds but other rejected them; one even spit out his brownie! I loved them! And I think these muffins sound delicious. Yes beetroot is very divisive. Not all will love these muffins! There’s a very good version of chocolate cake that has beetroot at its heart too! Yes – I’m a big fan Jonathan. Yes they are quite an amazing colour. Shockingly so when they emerge from the oven! I think children might struggle with the earthy taste of the thyme and walnuts. I’d put in some apple and sultanas to tempt them. I have to say, I have never eaten beets. I have eaten their tops, but not the beets themselves. Your muffins make me want to reconsider my stance on them. Gorgeous! The tops are good but you should try the roots. Start with a beetroot and yoghurt raiita or dip – really refreshing. Oh… WOW… I love these! So vibrant and with a taste to match, no doubt. I love the idea of adding something creamy like goat’s cheese next time. Gorgeous. Thanks also for the tips on beetroot uses! I must admit, though I absolutely love the flavour, I’m not always sure how best to use this vegetable. I will try some things on your list soon – probably the barszcz! Love it! Bravo – healthy and tasty! Could you mail me some from Dubai?? These really need to be eaten on the same day Joan or they’d be in the post now! Thank you Terra. It’s always worth taking a new look at an ingredient I think. There are lots of recipes for sweet muffins with beetroot and chocolate so this is quite unusual. That’s the spirit Tandy! I’ve learned that beetroot is very divisive since I posted this! Beets are so delicious, my husband and I enjoy eating them. My kids not so much. I bet they would like it more if baked into pretty muffins like yours. Love their vibrant color. I have to say my teens were appalled by the idea of eating beetroot in muffins but begrudgingly admitted that they were OK when tasted! The thyme might be a step too far for young children – recommend a few sultanas. You are right Sue – not everyone will like these (no chocolate and a root vegetable that isn’t everyone’s cup of tea) but those that do will really appreciate them. It’s a different flavour and very more-ish. Thanks for the nice comment though. I will certainly make these. I have a nostalgic fondness for pickled beetroot in a jar, but these muffins are far more chic than that old astringent memory of beetroot in vinegar. How delicious. Chic muffins – I like the sound of that! Thanks Charlie. Love your interpretation. Use of pomegranate molasses and pine nuts is inspired…. Brilliant. I have to say, I’ve never had pickled beetroot before! Sounds intriguing. I love the pretty pink color of these muffins. Thanks Sylvie – there aren’t many savoury things of this colour in the kitchen are there. Beautiful colour muffins and I’m going to have to bookmark these for next year – with cheese. The remainder of this year’s crop was eaten by voles before I had a chance to harvest it, so feeling a bit peeved as I had various plans. Two of the things I did managed to do were make beetroot and horseradish relish which was good but not as good as horseradishy as I was hoping and beet kvass. This last is super easy, tasty and excellent to aid digestion and as an all round health kick. I have to admit I am a bit of a phobe… and yes, it is that pickled stuff that put me off! But these days I do enjoy slow-roasted beetroot and it can be good in small quantities in a salad, especially with feta. never thought to put it in muffins! They sound awfully healthy ;o) I can’t live without butter, garlic, salt and cheese 🙂 Not a very balanced diet hahahah! I really like the rich colour that the beet gives to these muffins. 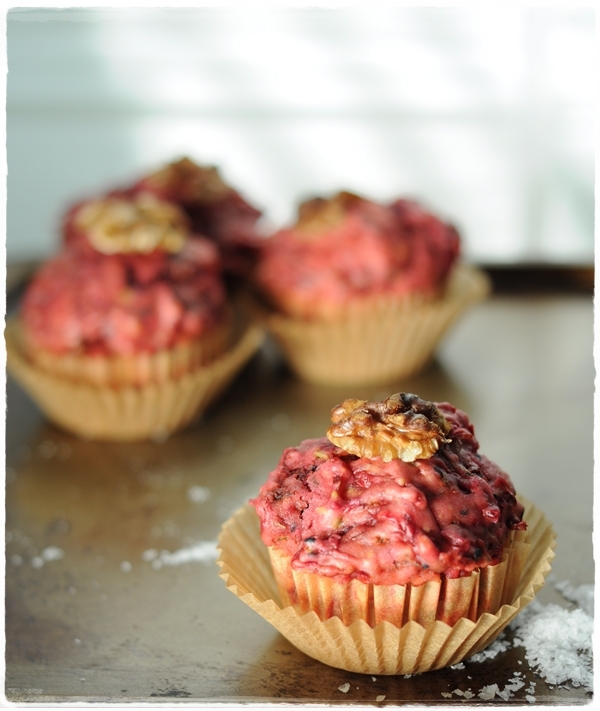 I love beetroot in so many forms but this muffins are something I need to try as soon as possible! I ove beetroot, and I enjoy carrot cake. Thus, I could find myself quaffing quite a few of these without a quibble, I’m pretty sure. They do look very pretty and I love the photo the last set of photos, especially the one on the left! I’m not a big fan of beet root and I find it quite challenging! It’s one of these ingredients that you feel if you didn’t use at least once you’ll always regret not doing so! Interesting post and I’m a big fan of your photography! Thank you Arwa – still on a photographic journey of discovery so appreciate the compliment. They are a very distinctive flavour – you definately have to be a beetroot love to eat these. Really good with a creamy cheese. Thanks for entering these gorgeous morsels into Simple and in Season! A ‘sweet’ round up will be up later on today! what great ideas for beetroot! I love the gorgeous pink colour of these muffins! Sally these look great. I was experimenting yesterday trying to make my own savoury beetroot cakes stuffed with goats cheese. The idea being they have a runny centre like a fondant, only all savoury served with pesto.